For the millions of smallholder dryland farmers who rely on rainfed farming, improved seeds are one of the most cost-effective ways to enhance their yields, food security and livelihoods. 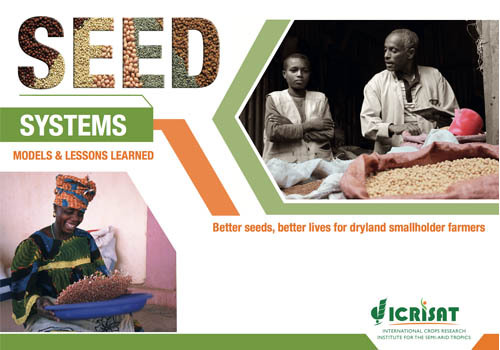 ICRISAT’s Seed Systems Models and Lessons Learned booklet explains the rationale of ICRISAT’s work on seed systems in the drylands, the different approaches and their impact on the ground. Different models of seed systems are tested and developed by ICRISAT and its development partners in sub-Saharan Africa and Asia depending on the local context. It includes small seed packets, groundnut seed revolving fund in Malawi, support to community-based systems, farmer seed organizations or local seed ventures, and public private seed partnership- like the Hybrid Parents Research Consortium for pearl millet and sorghum in India. ICRISAT’s vision on seed systems is demand-driven, holistic and working in partnership, along the crop value chain.